Morpeth Lion President Margaret Trewick, with new Lions Andy Bateman, Craig Fraser and Ian Nelson, and Lion sponsors Ian Mills and Lilian Nelson. 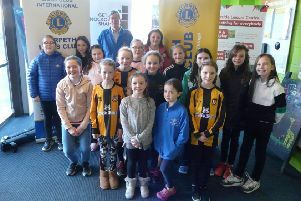 The membership of the Lions Club of Morpeth is getting even younger — or at least the average age is. Since the beginning of the year the club has welcomed four new members. This is good news for the club for a number of reasons. Firstly, the health of the club is enhanced by the skills of the new members, then there is their enthusiasm and ideas. For many years the Morpeth public has seen the same ‘old’ faces undertaking the activities for which the club is well known, not that there is any diminishing of these members’ keenness. Over the past 18 months there has been a sharp increase in membership and ideas for enhancing the club’s commitments of service to our community, which now include environmental concerns, such as helping with litter-picking and extending our involvement in Carlisle Park, and assisting with orienteering events, and there are some suggestions still being considered. One area where there were shortcomings was the ever-present social media. Fortunately, a number of the new members have expertise in this field and thus The Lions Club of Morpeth now has a regularly updated website and facebook page. These include a ‘Donate’ button and an ‘Easyfunding’ link. The pages have generated additional interest in the club’s activities, and enquiries about how one becomes a Lion. So it is ‘all systems go’ for Morpeth Lions and its future. • To say that the Lions Club of Morpeth’s first Fashion Show was a success would be an under-statement. More than 130 guests enjoyed fashion, music, cute dogs and refreshments, leading to more than £1,750 being raised for Cleaswell Hill’s hydrotherapy pool. The evening started with a welcome from Lions President Margaret Trewick, before cabaret from Jason King got things off to a swinging start, followed by the initial show of fashions from Boutique Ravello,expertly modelled by local ‘models’. This gave some of the ladies ideas for their wardrobes. At the end of this fashion interlude, some of the models shimmied down the catwalk accompanied by canine friends suitably attired. The dogs and their accoutrements were arranged by Pets HQ and proved to be a hit. There followed more great singing by Morpeth’s Lou Coel, which brought some of the audience onto the floor, then there were hair tips from Laura Anderson and a demonstration on how a scarf can be transformed into beach cover. During this time some delicious nibbles were served. The entertainment came to a close with Jason King. There had been very generous raffle prizes donated by local businesses and these were duly drawn. Margaret thanked the guests for their attendance, the businesses and models who took to the stage or donated prizes, and Riverside Lodge for hosting the evening. She paid particular tribute to Les Sage, who worked tirelessly to bring the night to Morpeth.